SAN DIEGO -- For a school accustomed to competing for national championships, it has been a down year for Oklahoma. The Sooners head into the Holiday Bowl unranked and with something to prove. After participating in the Bowl Championship Series national championship game the past two years, Oklahoma players do not view their matchup with Oregon as a cameo appearance in a second-tier bowl game. "For this team, this is our national championship," senior defensive tackle Dusty Dvoracek said. "We're not even a top 25 team. We have a chance to play the No. 5 team (BCS rankings) in the country on ESPN, on national television. It's the only game on that night. It's in San Diego. It's a big-time bowl. "For us, this means the world to our season. A victory could make this a big success for us from where we came from." Oklahoma struggled out of the gate, losing at home to Texas Christian in the season opener. The Sooners were 2-3 after a 45-12 loss to Texas, but rallied to win five of their past six games. There were growing pains at quarterback. The departure of 2003 Heisman Trophy-winning quarterback Jason White took a toll, and so did an early season high-ankle sprain to sophomore running back Adrian Peterson, the 2004 Heisman Trophy runner-up. Redshirt freshman Rhett Bomar became the starting quarterback in game two, and his development, along with a healthy Peterson, coincided with Oklahoma's strong finish. "Our motivation is really high," Bomar said. "We want to win our last game for our seniors. We also have a lot of young guys who haven't played in those national championship games. We're hungry to go out and get a win and shoot us to next year." At Oklahoma, where success is measured in terms of conference and national championships, the 2005 Sooners have fallen short of expectations. Of course, expectations are always high at Oklahoma. Since coach Bob Stoops took over in 1999, the Sooners are 74-16, have played in three BCS national championship games, and won the national title in 2000. The school still holds the NCAA record with 47 consecutive victories from 1953-57, and has won seven national championships. With so much past and recent success, the 2005 campaign has been a disappointment for Oklahoma. "You feel that to some degree," said Stoops, whose younger brother Mike is the head coach at Arizona. "You just fight your way every year to try and put yourself in that position to win a conference championship, be in the BCS, or the national championship game." Oklahoma might not be too far away from a return to form. 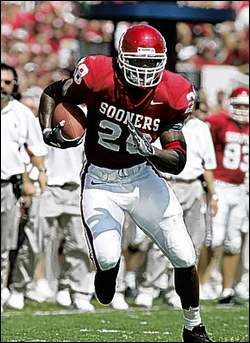 Peterson, who rushed for 1,925 yards as a true freshman, is the key to Oklahoma's offense. A power back with speed, Peterson led the Big 12 Conference in rushing this season with 1,024 yards and has regained the form that allowed him to become the only player in school history to be named all-American as a freshman. In Oklahoma's final regular season game against Oklahoma State, Peterson rushed for a season-high 237 yards, including a school-record 201 yards in the second half of Oklahoma's 42-14 win. "When healthy he's been phenomenal," Stoops said. "Once he regained his strength in his ankle, he could run with the power and cuts he had before. He really came on once he was over that injury and has been sensational in every game since." That could be bad news for the Ducks, who gave up 183 yards to Peterson last season in a 31-7 loss at Oklahoma. The teams will play again Sept. 16 in Eugene. While the Sooners have more than two losses for the first time since Stoops' first season in 1999, their four defeats have come against quality opponents. TCU, UCLA, Texas and Texas Tech are a combined 38-5 and nationally ranked. Oklahoma's schedule was among the most difficult in the country. "Oklahoma is a great football program and a great team playing at the top of their game. They're healthy now," Oregon coach Mike Bellotti said. Oklahoma will have a new offensive coordinator for the bowl game. Former offensive coordinator Chuck Long was named head coach at San Diego State on Dec. 17, and Stoops promoted Kevin Wilson to offensive coordinator. Long will not coach in the bowl game. In addition, Josh Heupel, quarterback on the Sooners' 2000 unbeaten national championship team, was named quarterback coach Thursday. How those changes affect Oklahoma remains to be seen. "He will be missed a lot," Bomar said of Long. "He was a great coach. He helped me out in my development." Although Bomar is a first-year starter, he does not figure to be overwhelmed in his first bowl appearance. "I think that helps out a lot playing in the Cotton Bowl against Texas, and going to Nebraska. Those are great environments to play in," said Bomar, who gives the Sooners another dimension with his running ability, much like Oregon starting quarterback Dennis Dixon. Despite Oregon's 10-1 record, the Ducks are only a 3-point favorite to beat Oklahoma. The Sooners have won all five of the previous matchups, but those games were played in Norman, Okla.
Oklahoma will be playing in its 39th bowl game, seventh most in NCAA history, and looking for a 24th bowl win. Stoops said a victory against Oregon would provide a springboard for the 2006 season. "When you win that last game, especially with a big challenge facing Oregon, a team in the top five in the country, it's exciting and it would give you a boost, definitely," Stoops said. WHEN: 8 p.m. EST Thursday.